It’s a scientific fact that your Nervous System (brain, spinal cord and nerves) control and regulate every single cell, tissue and organ in the entire body. This system is often referred to as the Master Control System for this very reason. It is the very first system to form during fetal development; before your circulatory, respiratory, immune, reproductive and all other body systems. If there is any hindrance to the vital nerve links anywhere between your brain and your body, ill-health, sickness and disease can result. The most common sources of nerve interference are due to stresses on the body. In particular physical, chemical and emotional stress that cause pressure and irritation to nerves and/or alter the physiology of the person. Due to these hindrances, all of the cells, organs and muscles that these nerves control will be dysfunctional to some degree. If this nerve interference is not corrected, your body responds through its natural defense mechanism by inducing pain and/or symptoms, letting you know there is a problem. Pain/Symptoms are usually a late stage event, occurring once the body can no longer adequately adapt to the stresses put on it. You can have dysfunction to your nervous system, creating decreased function of your organs and never know it. Remember, feeling pain or having symptoms occurs after dysfunction has set in and the body is alarming you of a big problem. Just because you “feel” good does not mean you function well. If you have never heard of Vertebral Subluxations or Subluxations for short, that’s OK. There was once a time when none of us knew of or heard of Cancer, AIDS and Diabetes. So what are Subluxations? The spinal column is composed of 24 rings called vertebrae. In between these vertebrae are discs and inside the vertebrae there is a canal that houses the spinal cord. Adjacent to that, are nerve roots exiting the spinal cord and extending into yet more nerves that travel to all cells, tissues and organs. These nerves supply the entire body with the life force necessary to sustain you and keep you alive and healthy. This communication system naturally functions flawlessly as long as there is no interference to it. The problems occur when the bones in the spine get misaligned, causing irregular joint motion and often irritating and/or putting pressure on the surrounding nerves. This is a Subluxation! Ultimately, these subluxations (nerve interference due to misalignment of bones) decrease the vital signals that go through the nerves to all organs and muscles, causing dysfunction to those areas. The vertebral discs, ligaments and other connective tissues can also become inflamed. Lack of proper nerve signals to a muscle causes it to become tense and tight or the exact opposite, it becomes weak. For example, if interference occurs to the nerves of the heart, it may cause increased heart rate, palpitations, changes in blood pressure, etc. If lack of proper joint motion occurs, this causes muscle imbalances, bony spurring and arthritic degeneration (osteoarthritis, degenerative disc disease). 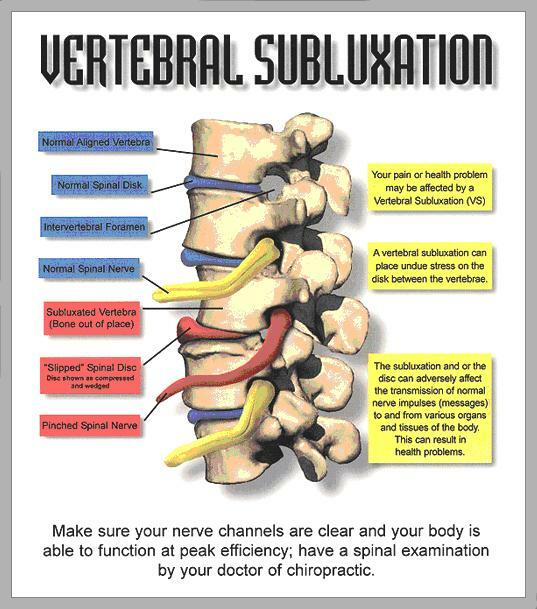 There are an endless number of symptoms, problems and conditions that can be caused due to Vertebral Subluxation! How do we get Subluxations? In short, by the stressors in our daily lives! The following are the 3 most common. 1.Physical stress in the form of the birth process, slips, falls, car accidents, repetitive motions, bad posture, improper lifting, etc. 2. Emotional stress from anger, fear, relationships, work, school, etc. 3. Chemical stress from pollution, poor diet, drugs, alcohol and other toxins we breath, inject or swallow regularly.` How do you correct these Subluxations? Please read below, “chiropractic adjustments”. Doctors of Chiropractic (DC’s) are the only health professionals that are highly trained to give specific adjustments to the spine or extremity joints in the body. Chiropractic doctorate programs are often 4 years of intense education and training. Chiropractic is a science, art and philosophy based on principles and laws on how the body works beginning with nerve system function and how the body has an innate (inborn) ability to self-heal and regulate. Chiropractic care is 100% natural, without the use of drugs or surgery or any invasive procedures. It is completely safe and effective! Chiropractors analyze the spine through various specific exams such as testing range of motion, palpating, checking balance, posture, performing orthopaedic and neurological exams and using X-ray’s in many cases. After complete examination and analysis, the Doctor of Chiropractic knows exactly where you have these Subluxations. Chiropractic adjustments are given to the spine with specificity and focus in order to move a fixated, misaligned bone back into its proper position. Overtime, your body adapts to the adjustments and starts to hold the previously misaligned bones in their proper place, restoring normal nerve signals, improving function, reducing or eliminating pain and/or other symptoms and getting you back to health. Improved quality of life and well-being are your only side effects! There are many chiropractic adjusting techniques making it easy for just about anyone to get adjusted. Newborns, infants, children, pregnant women, seniors, athletes and even those who have failed back surgeries. The chiropractic care you receive will be tailored to your unique needs, based on your exam findings, age, size or even in some cases preference. Chiropractors often use their hands to adjust, giving a quick specific thrust. There are also small instruments that can be used or special tables that have sections that move. Chiropractic, unlike medicine is not a one size fits all approach. There is no one pill or potion (or adjustment in chiropractic) that’s given to anyone with one specific condition. In fact, Chiropractors realize that this is a faulty model because we are all unique individuals with unique differences and presentations. Chiropractic takes into consideration your person as a whole and specifically works to get to the root cause of whatever is going on. Visit a Chiropractor today, you will thank me later!